I like what you call Bollywood. What this book is all about that’s what I am about. This is what I do this lights this camera this Masala, this is me. I love it. I grew up watching it. I’ve clapped, I’ve cried, I’ve laughed. And I hope I can do this till the day I die. You cross one hurdle you achieve one more landmark; you get hysterical about what to achieve after. How can you not come back for more? There’s always a greed for more. An insider’s look at the glitz grit and grandeur of Bollywood the world’s largest film industry. Lights camera Masala is a celebration of contemporary Hindi cinema popularly known as Bollywood. 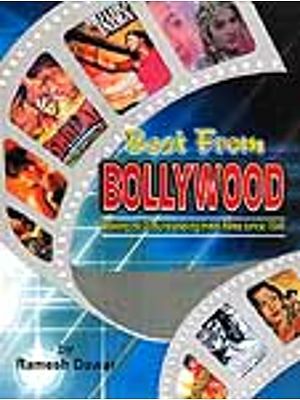 The book documents the fascinating pricess of making a typical commercial Hindi film through the adventures of a pair of fictitious characters called Vijay and Ravi as they endeavour to make a Bollywood film of their own. Famous film personalities –form seasoned scriptwriters such as the Salim Javed duo, to celebrated actors such as Amitabh Bachchan, Shah Rukh Khan and Aishwarya Rai and renowned directors like Ramesh Sippy and Karan Johar-all share their experiences and provide fresh insights into film making. Light Camera Masala also records the stories of the behind the scenes people who are such an intrinsic part of the Bollywood machinery- a light boy, a make up artist and a choreographer, among others. Featuring the emergence of stars as brands and culminating with the glitzy IIFA awards the book is a visual extravaganza. First of all let’s deal with the issue of the word Bollywood. Several Hindi film industry practitioners, who rank amongst the great and the good dislike it because they perceive it as a pejorative term the general thinking being that India’s national cinema does not deserve an appellation derived from Hollywood. Also since the powers that be have changed the city’s name from Bombay to Mumbai, the term Bollywood is no longer relevant in any case. Arguments can be made on either side; on the one hand, it is common knowledge that Hindi cinema shamelessly and repeatedly plagiarises from its western counterpart, so what’s wrong with tag? On the other India produces more films than any other country in the world films that have a unique cultural resonance all over, so does the industry deserve to labour under this label. The fact remains that Bollywood has like it or not become instantly recognizable shorthand to describe the Mumbai based Hindi film industry both in India and internationally. Therefore in the absence of any other pithy term to describe this industry, we will continually use Bollywood in the text. Apologies to those who find this offensive, but we use the word with the greatest possible respect to describe an industry that we breathe sleep, shoot write about and above everything else love. And while we are on apologies many of the revered Hindi film industry practitioners in this book have been referred to by their first named, rather than the standard practice of using surnames. This is not because we are on first name terms with them, but because of the sheer number of similar surnames within the industry. For example a Khan could be Shah Rukh, Salman, Aamir, Saif or Zayed, while a Kapoor could be Rishi, Randhir, Kareena, Shashi, Shammi, Anil or Raj. Further, there are several chopras Sippy, etc. hence the decision to use first names in the interest of clarity. The rise and rise of Hindi cinema has been well documented. Anecdotes about actor/director Raj Kapoor’s popularity in Russia or the success of the film Devdas (2002) in France are legion. Instances of Hindi films dubbed into Bahasa Indonesia and beamed on national television in that in that country or the extended run of Amitabh Bachchan films in Cairo theatres and in addition, there is more than twinge of pride in the hordes of Indian tourists passing through Leicester Square when they see a bold and beautiful poster advertising the latest Bollywood extravaganza on the Empire cinema display board. That’s why, elsewhere in this book, Shah Rukh khan says without a trance of irony that he is the biggest star in the world. Because Bollywood stars are indeed quite simply the biggest stars in the world. There is of course the advantage of population India boasts of over a billion people. Then there is the 20 million or so Indian diaspora plus the fanatic following the films enjoy in neighbouring countries and diaspora. And if we add the millions of Bollywood fans in palaces as far flung as the Arab world the Caribbean south east Asia and Africa the numbers far outweigh the reach of say a Tom Cruise movie. While the films themselves are celebrated and their makers idolized. Not much is actually known about the process through which a typical Bollywood product is realized. Rather than do a dry exposition of this process, we decided to approach the practitioners themselves and get their version of how the gigantic Hindi film machinery works. Their experiences and anecdotes are the soul of this book we have managed to gather a fair representation of the best-known people in the industry and have recorded their views. There are omissions some of the people approached were busy and could not give us the time for an interview. Make no mistake; this is neither a manual nor a textbook. Rather this is a snapshot of a period in time covering a few months of 2005 and 2006. Like a good Hindi film, we have provided a few flashbacks as well, but not beyond the 1970s. And then of course there are the photographs the pictures, that provide a unique view into this maddening chaotic yet endlessly fascinating industry. Before we proceed further, it is necessary to explain exactly who vijay and Ravi are. The mid to late 1970s saw the flowing of the buddy movie in the Mumbai film industry or as is commonly known within that industry, a two hero project with the marquee name taking top billing and a slightly lesser star taking second films like Haath ki Safai (1994) Khel Khel Mein (1975) Chacha Bhatija (1977) and Asp ke Deewane 1980 are excellent examples of this genre. However they did not feature the biggest star Hindi cinema had ever known: Amitabh Bachchan. Amitabh was called ‘Vijay’ in many of films. It was his lucky on-screen name. The name ‘Vijay’ encapsulates the essence of 1970s Bachchan a Bachchan fondly remembered even today when he has managed to transform himself into an elder statesman of Indian cinema. As Ramesh Sippy, who directed him in Sholay (1975) says, he remains a formidable force in any film. The 1970s was the decade that made Amitabh Bachchan and firmly established him –or his alter ego Vijay as the angry young man. Vijay was the epitome of cool, the lanky laconic man who never lost his nerve had a killer throwaway line delivered in a deadpan voice for every occasion and remained casual and unflappable punctuated by bursts of terrifying intensity or madcap comedy. The extremely handsome Shashi Kapoor was the ideal foil to Bachchan. He belongs to one of the first families of Bollywood filmdom. His father, Prithviraj Kapoor was a huge star in the early years of cinema while massively popular too. The Kapoor family is in its forth generation now, with the well established actresses Karisma and Kareena.